Dr. Zoumalan’s office usually gives one total price which estimates what you expect to have to pay out of pocket. If you want the breakdown of the estimate of each part of the Beverly Hills rhinoplasty cost, feel free to ask. The insurance company can help pay these and therefore bring the total price of the rhinoplasty down, sometimes significantly. What Makes up the Total Cost of Rhinoplasty Surgery? is a profession fee charged by the rhinoplasty surgeon. This price depends on how complex the surgery is expected to be. No two rhinoplasties are the same, so this number can vary depending on how many maneuvers the surgeon expects to do. There is some estimation involved in this, because sometimes the surgeon makes decisions during the operation that may make the rhinoplasty longer. Some rhinoplasties seem simple on the outside, but once the surgery gets going, it may require more time than estimated. The rhinoplasty surgeon must use experience to determine this cost. Insurance can help pay for part of this, if there is a breathing problem. Breathing problems are known as functional problems, because they pose a problem for the function of the nose, which is breathing. is based purely on time. This is also known as the Facility Fee. Each facility has its own hourly rate. Hospitals tend to have a significantly higher rate. For this reason, almost all rhinoplasty surgeons operate at Surgery Centers. These are state-of-the-art, highly certified facilities which provide the ultimate patient care, all while maintaining lower costs than a hospital. Surgery Centers also have been found to have a lower infection rate and a more personal experience. For patients that care about their privacy, these centers provide the ultimate in private and personal experience. Insurance can also help with the cost of this, if you have a breathing or sinus problem. is based on time. Your insurance can help pay for this as well, if you have breathing or sinus problems. The cost of a Beverly Hills rhinoplasty is based on how much surgery needs to be performed. More complicated rhinoplasties need more time in the operating room. Because the cost of rhinoplasty includes the cost of the operating room facility fee and anesthesiologist’s fee, a longer surgery will increase the price of all of the above. is almost always less expensive than revision rhinoplasty. is less expensive than the full rhinoplasty. Tip rhinoplasty only focuses on contouring the lower third of the nose. It is shorter and simpler, which lowers the cost of all three parts of surgery. (also known as secondary rhinoplasty) is usually more complicated and more challenging. The nose has been altered and there is scar tissue that makes the surgery slower. Furthermore, revision rhinoplasty usually requires the use of grafts which make the surgery longer and more complicated. Cost is minimal. Much of this will be provided for you. If you have someone who can help you the first evening (family member or friend), this is preferable. Some patients choose to stay at a recovery center for a night. We can arrange for this. 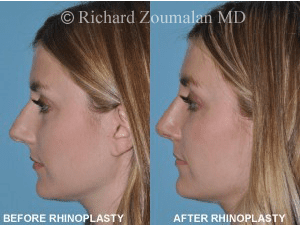 This is an extra cost, and is usually unnecessary for rhinoplasty, as there is not much that the patient needs.
. WE CAN USUALLY GIVE A BALLPARK NUMBER IF WE SPEAK WITH YOU. Rhinoplasty is one of the most complicated surgeries in plastic surgery due to the delicate nature of the nose and the way the nose heals. It is important to find a surgeon that focuses on the nose and face.